Pivot: Empowering Trafficked Victims is a product with a hidden message intended to help victims of human trafficking become aware of their rights and the organizations that can help them. Because the information is hidden inside an everyday product, it can reach victims without their captors’ knowledge and without direct service-provider-to-victim contact. The pilot for this concept targets female victims; the product is an ordinary-looking sanitary pad, something that is used when a person is alone. Folded inside the pad is a water-soluble insert containing a message and a hotline number that can be accessed when a victim is physically and mentally ready to get help. Ideally, a woman will be alone in a restroom when she finds the message, enabling her to read the information, detach the phone number and flush the rest of the insert in the toilet. The pads will be distributed to at-risk women through health clinics, human-services organizations and community organizations. The insert is printed on water-soluble paper so it can easily be destroyed after detaching the hotline number. The hotline number is disguised as a fortune cookie wish, so if discovered by a trafficker, it would not raise suspicion. The insert also addresses time constraints, language barriers and varying levels of literacy by using text in combination with illustrations that have a relatable level of abstraction. Additionally, in collaboration with the Washington Anti-Human Trafficking Network (WARN), the culture of the at-risk person was considered in developing imagery and language that invokes trust. 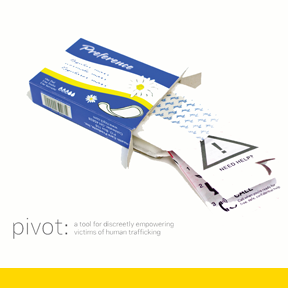 Pivot was designed to address several specific problems in human trafficking. According to human-rights advocates, human trafficking victims can only be helped when they are emotionally and physically ready to leave their captors. Simply put, most victims aren’t rescued; they choose to seek help. The problem that many victims face is that once they are ready to seek help, they don’t know where to turn. At the same time, victims are usually under close scrutiny by their captors, making it difficult to carry rescue information with them. According to some victim services providers, victims are most at risk of violence from their captors when the captors suspect the victims will try to escape. Pivot provides a way for victims to discreetly keep crucial information until the moment they are ready to use it. When ready, a victim can call the national hotline number listed on the insert and speak directly with a resource who will connect her with housing, legal, emotional and financial support. Pivot is not a stand-alone solution to the entire problem of human trafficking; rather it offers an effective to address the problem of providing discreet rescue information to some hard-to-reach populations. Although the current product is intended for trafficked women, the basic concept can be expanded to items that would target trafficked men.